Happy New Year – I hope 2015 will bring you lots of good things. 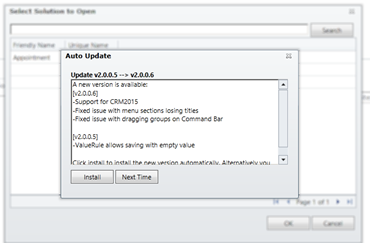 Dynamics CRM 2015 upgrades are rolling out to Dynamics CRM online organisations with rapidly increasing frequency and so I have updated the Ribbon Workbench for 2015 support. You will see a new update notification when you next open the Ribbon Workbench and you can let the auto update do the download and install for you. If you would rather install manually you can download and install over the top of the previous version. Automatic update is mandatory after 10th January – why?